Spice up your morning ritual with Greens Plus Advanced Multi Vanilla Chai! Advanced Multi is now a fully functional wholefood multivitamin that is also soy, gluten and dairy-FREE. 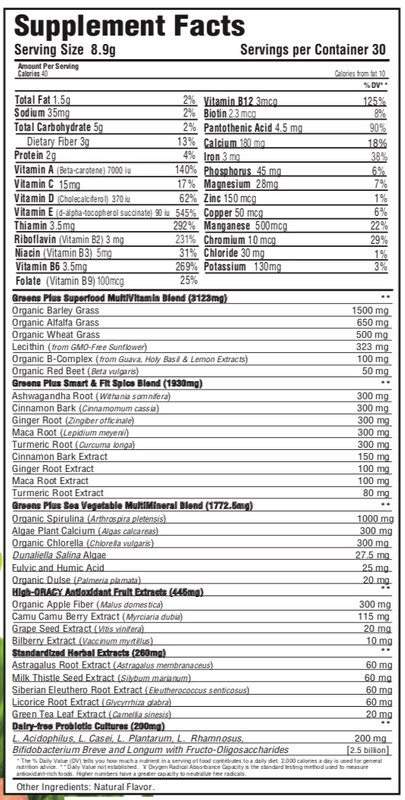 Greens Plus Advanced Multi Vanilla Chai is a a fully functional wholefood multivitamin that is also soy, gluten and dairy-FREE. We've taken our original greens formula and made a new breakthrough - a 100% complete, greens based whole food multivitamin. By combining raw green foods, organic vitamins, essential minerals, enzymes, and turmeric, ginger, cinnamon, maca, & ashwagandha, Greens Plus Advanced Multi Vanilla Chai provides a fully charged blend of brain boosting nutrients. Greens Plus Advanced Multi Vanilla Chai is 100% soy, gluten, and dairy-free. One serving of Greens Plus Advanced Multi Vanilla Chai is equivalent to 5 servings of fresh fruits and vegetables based on ORAC*.